This chart is currently causing a lot of grief at your favourite independent hothouse-greenhouse-teahouse at the moment. Half the agency (don't tell the clients!) 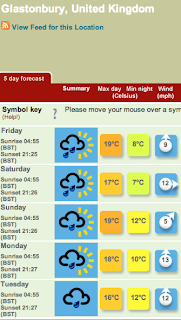 are off to Glastonbury this coming week and, as is typical for festival time, the weather is turning right bad. Obviously as your agency blogger I will not be going as it's more important to keep this going rather than throwing my arms in the air like I just don't care. But I feel for our soon-to-be waterlogged people. Take your brollies campers.